Small tree or shrub to approximately 20' with smooth brown to grey-red and green trunk. Large Yellow flowers winter-summer and very interesting warty seed pod. 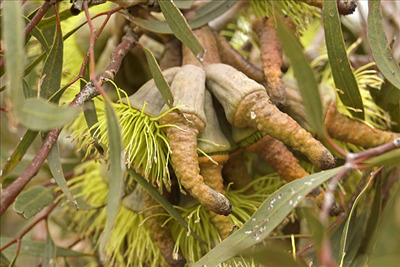 It grows in southern Western Australia near Ravensthorpe Range. Good tree for apiarists as it produces a lot of nectar. Fast growing and bird attracting in flower. Seed pods can be used in dried flower arrangements. Propagation Information: Seed germinates easily.